Two early pioneers in gifted education, Margaret A. Neuber and Dr. Hedwig O. Pregler, organized a Conference on Gifted Children and Youth in May, 1951. They coordinated efforts across the state by forming the Pennsylvania Association for the Study and Education of the Mentally Gifted (PASEMG). Their interest emphasized gifted education before the national concern about gifted education that was based on the Russian Sputnik launch in 1957. Margaret Neuber was the Chairperson of the Special Education Department at Penn State. Dr. Pregler was the principal of Colfax School in Pittsburgh. In honor of them, PAGE has annually awarded the Neuber-Pregler Award to persons who make lasting contributions to gifted education within the state since 1971. The first Neuber-Pregler Award was presented at Lebanon Valley College Conference in 1972. For a list of award winners, please click here. PAGE is a member based, non-profit organization with a Federal IRS classification of 501(c)3. A letter confirming this classification is available upon request. Bylaw changes must be approved by a majority vote of attendees at the membership meeting held at the annual conference. To view our current bylaws, please click here. Policies are maintained by board vote and align with the bylaws. The PAGE Board is composed of members elected by the majority vote of attendees at the annual membership meeting. Board members may serve partial terms when elected by the Board. The Executive Committee includes the President, Secretary and Treasurer as required by law for a non-profit organization. In addition, the Executive Committee includes a Vice-President and Affiliate Director. Other positions are filled by Members At Large, as determined by the board. PAGE has one part-time, paid position, an Administrative Assistant. This role helps PAGE with day-to-day organizational needs, membership lists, conference details, coordination of communication, and other objectives as indicated by board members. PAGE published its first Newsletter in March, 1958. This was succeeded by the PAGE Report from 1974-1981, followed by the PAGE Update. Other PAGE publications have included PAGE Alerts, Handbooks for Teachers and Parents, PAGE Bulletins, Read and React Documents, Calls to Action and Mail Chimps. In an attempt to stay up to date and be fiscally responsible, PAGE no longer prints hard copies of articles and mailings but has moved to online options for communications with members, legislators and education officials. Copies of past publications are maintained in PAGE’s storage area. The original PAGE emblem was adopted on April 21, 1961 and was the symbol of Minerva, the Goddess of Wisdom and Learning. In July, 1981 a contest resulted in a new logo and in 1991 this logo was chosen. This logo was adopted in February of 2010. The current logo was selected in August of 2016. PAGE continually endeavors to contribute and improve services that provide for the educational needs of children and their families. A statewide conference is held on an annual basis for educators and for affiliate groups. These conferences provide expert speakers on gifted education and networking opportunities for the betterment of gifted students in the Commonwealth. 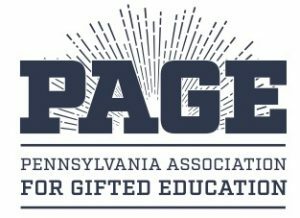 PAGE board members have met with members of the Pennsylvania Department of Education (PDE) and with both State and Federal Legislators to influence the regulations and legislation for gifted students. PAGE members have presented at conferences for sister organizations such as the Pennsylvania State Education Association (PSEA), Pennsylvania School Boards Association (PSBA) and PDE. We encourage local boards of education and administrators to develop and expand services within their districts. PAGE maintains a help-line for both members who have questions. PAGE also is actively involved in supporting parents in several court cases as Americus Curiae on behalf of gifted children. PAGE recognizes outstanding service by educators, parents and students at its annual conferences. As an affiliate of National Association for Gifted Children (NAGC), PAGE supports and participates in NAGC conferences and legislative efforts. Since 2000, PAGE leaders have advocated in Washington, D.C. at the NAGC Affiliate Leader’s Conference. Members presented sessions on Teacher Education and Relations, Curriculum, Guidance and Counseling, Administration and Higher Education to the Governor’s Task Force. Communicated with the US House of Representatives Committee on Education and Labor regarding Legislation for Special Education. PAGE participated in the Governor’s Committee on Children and Youth. Representatives from PAGE testified before hearings of the PA State Board of Education regarding procedures and regulations pertaining to gifted children. PAGE became a member of the Consortium to discuss PA State educational matters. PAGE authorized the organization of local affiliate chapters in the West, Central and Eastern parts of the state. The affiliate groups provide parent education, assist in advocacy at the local level, and provide information on the current status of gifted education in the state. PAGE provided a series of sixty second pre-recorded tapes of public service announcements for distribution to radio stations across the state. PAGE also provided support in conducting the Future Problem Solving Bowl. A member of the PAGE board of directors conducted a review of gifted programming in 11 Intermediate Units. Primary concerns included poor documentation, due process procedures, substandard classroom space, inadequate programs, unspecific curricula, and inadequate in-service and supervision. PAGE then formed a task force to recommend certification standards for teachers of gifted students. The task force surveyed educational organizations and acquired letters of support from universities endorsing this recommendation. A legal basis for this proposal was presented to various officials at the PA Department of Education. The State Board of Education held 3 hearings to consider adoption of PAGE’s request. PAGE cooperated with PA Department of Education to compile a list of summer programs offered by PA colleges for 6 – 18 year olds. There were 84 institutions offering programs in 98 locations. PAGE initiated an annual Educator of the Year Award to recognize educators who influence gifted education beyond their district responsibilities. A handbook for teachers and parents entitled Gifted in Pennsylvania was prepared and published by PAGE in 1989. It was widely disseminated throughout the state. presented testimony on behalf of gifted students. Following the revision, PAGE developed a checklist for parents explaining student rights. PAGE held sessions with regional affiliate directors to provide guidance in training parents in effective advocacy for gifted. The website was used as a model for other gifted state and national organizations. PAGE always used advocacy, determination and pressure to insist that the Pennsylvania Department of Education (PDE) institute enforce school district compliance with federal and state regulations for gifted education and more specifically Chapter 16 after it was adopted by PDE on December 8, 2000. At that time gifted was separated from Chapter 14, Special Education. Hundreds of hours have been spent and will continue to be spent advocating, educating and building connections with political leaders and the key figures at PDE to ensure the continuation of Gifted Education in Pennsylvania. PAGE celebrated it’s 50th anniversary by sponsoring past Presidents and leaders in gifted education. Board members worked with PDE to develop Gifted Guidelines to coordinate with Chapter 16 which play an important role in helping districts to develop and implement programs for gifted. Chapter 16 was under review by the Board of Education. PAGE board members testified at the stakeholders meeting, three roundtable sessions, Legislative committee hearings, and meetings with the Governor’s staff to advocate for changes to Chapter 16. Requests included stronger compliance and monitoring processes, lower caseload numbers for teachers, clarification of identification processes, provisions for assessing needs, and complaint process for parents. PAGE testified at the Independent Regulatory Review Committee. Due to efforts from PAGE, annual compliance monitoring of 10 school districts was included in Chapter 16 and PAGE board members helped develop the documents used for the monitoring. PAGE worked unsuccessfully to have language included in Chapter 49 to require certification standards for teachers of gifted students. The PAGE website was re-designed and updated with links to helpful resources for parents and teachers. PAGE became a member of the ad hoc Special Education Communication Committee through PSEA so that all advocates of exceptional children were represented. Revisions to Chapter 16 were approved and many of PAGE’s recommendations were adopted. Several members of PAGE, both parents and educators, were selected for the committee to review documents referenced in Chapter 16 for GIEP’s and gifted processes. PAGE and PSEA joined efforts to publish and distribute informative publication about gifted education, Understanding and Challenging the Gifted: An Introduction for Teachers. PAGE alerted its members of cuts to the funding for the Governor’s Schools of Excellence and advocated unsuccessfully to continue the previous funding level. PAGE partnered with numerous organizations in support of the Costing Out Study by PDE that sought for fair funding for all students and PAGE continues to ask for support for gifted students in the PA School Funding Formula. A PAGE board member was asked to serve on the Office of Dispute Resolution Stakeholder Panel. This resulted in hiring and designating a hearing officer versed in Chapter 16 to hear Gifted Due Process cases and lead to the development of a Pro Se Manual for parents who wished to represent themselves at Due Process Hearings. The popularity of Understanding and Challenging the Gifted led to a partnership with PSEA and PTA to publish a similar pamphlet for parents. The webpage was updated with a new address, giftedpage.org and the PAGE logo was redesigned. PAGE board members worked with Representative Ryan Aument to sponsor House Resolution 139 to investigate the funding and effectiveness of Gifted Services across the Commonwealth. This Resolution led to thorough research, interviews, and a summary report that included six recommendations that were forwarded to the Board of Education. A copy of these recommendations can be found by clicking here. In August of 2014, The State Board of Education adopted all six recommendations from HR 139 and directed the Department of Education to follow through on them. Among these recommendations was the creation of a voluntary Gifted Endorsement for Training Teachers. PAGE offered to help PA Department of Education, Bureau of School Leadership and Teacher Quality, develop the Framework for the Gifted Endorsement Guidelines. PAGE leadership chaired the committee and composed five of the 17 members on the committee. Over this time, PAGE hired an attorney and two different charitable organization consultants to establish needs, goals, and to be more effective as a non-profit group. The bylaws were rewritten to conform with current non-profit law for a membership based organization and the policies were reviewed to conform with the bylaws. The website was again updated and a new logo was designed. Pamphlets and brochures were coordinated with the website to increase brand awareness. PAGE leadership continued to work with legislators, PDE leadership and university personnel, PSEA and other organizations to further teacher training and advocacy for gifted education. Two board members presented on advocacy techniques at the NAGC conference.